Unlike some of his predecessors, UNLV football coach Tony Sanchez has made an effort for his team to embrace its Las Vegas history. Promotional pictures of Sanchez and his squad have featured The Strip and the Neon Boneyard Park while the field at Sam Boyd Stadium features the iconic Welcome to Las Vegas sign in the end zones. But the Rebels brought notoriety to city in a way Sanchez probably never envisioned with Saturday night’s shocking 43-40 season opening setback to lowly Howard. UNLV entered the contest as a 45-point favorite over the Bison, an FCS school from the not-so-mighty MEAC. Howard won a grand total of two games a year ago and was playing its first game under head coach Mike London. The ugly loss, which began with UNLV being flagged for offsides on the opening kickoff and also featured three lost fumbles, two missed field goals and 13 penalties by the Rebels, goes into the record books as the biggest upset in college football history. Howard’s two wins in 2016 were 33-28 over Norfolk State and 26-21 over Delaware State, which finished 0-11. 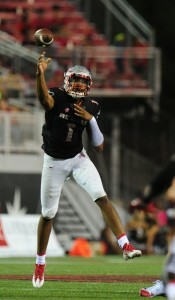 “It’s disappointing, and I feel bad for those UNLV football fans that have struggled for a long time,” Sanchez said. “The season is not over. At the end of the day, this is a week-to-week business. It’s my job to get everybody back on track and going. 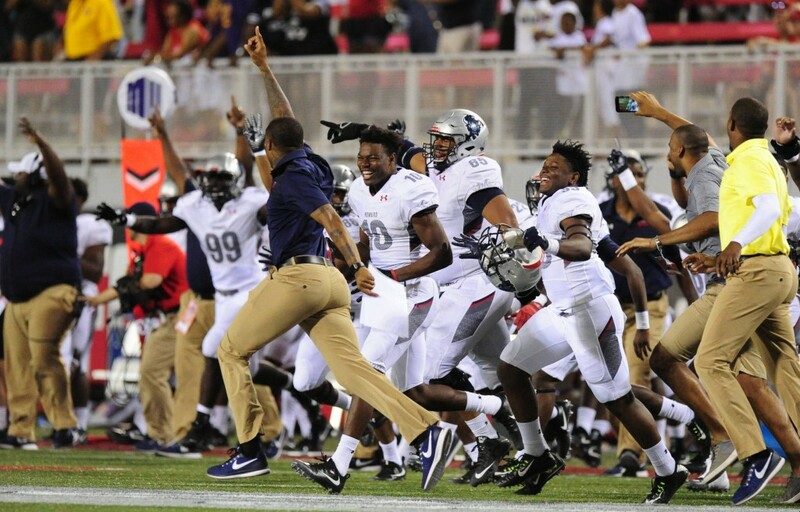 Howard joins FCS schools like Southern Utah (41-16 in 2011) and Northern Arizona (17-14 in 2012) that have defeated UNLV at Sam Boyd Stadium. The Rebels had pounded FCS schools like Idaho State (80-8 in 2015) and Jackson State (63-13 in 2016) in each of Sanchez’s first two seasons. On paper, this is supposed to be Sanchez’s best team, one capable of garnering a rare bowl berth. That’s what made Saturday night’s loss even more shocking. Quarterback Caylin Newton, a 5-foot-11 freshman who is the younger brother of NFL star Cam Newton, led the way for Howard, passing for one touchdown and rushing for a game-high 190 yards and two more scores, including the game-winning touchdown on a 4-yard run with 7:34 remaining. Howard finished with 449 yards in total offense and 309 yards rushing, converting 10 of 20 third downs along the way. UNLV finished with 564 yards and 344 yards rushing with junior Lexington Thomas leading the way with 151 yards on 21 carries and two touchdowns. Overshadowed in the loss for the Rebels was a solid debut by redshirt freshman quarterback Armani Rogers who completed 11-of-19 passes for 220 yards and a touchdown and no interceptions. Rogers also rushed for 82 yards on nine carries. The Rebels return to action Saturday at Idaho, a 28-6 winner over Sacramento State on Saturday. The Vandals, a Sun Belt Conference team that will be moving down to the FCS ranks next season, upset UNLV, 33-30, in overtime last season at Sam Boyd Stadium. Howard was a 45-point underdog at UNLV. Howard just beat UNLV.